This new circuit is based on the famous Marantz 7C vacuum tube audiophile preamp's line amp section. All the superlatives in the world won't capture what an actual listen will. Isn't it time to try one yourself? Simple connections. Add 285VDC and 265VDC, 6.3V heater voltage, input and output jacks and you're in business. Be sure to use a high quality Bourns, Noble or Alps volume pot (100KA, 250KA or 500KA recommended values) ahead of this circuit for best results. High retention ceramic tube sockets prevent tubes from accidentally shaking loose from their sockets. Polycarbonate and MKP capacitors are used in the signal path. Very low noise 1/2W CR25 series resistors allow me to keep the size of this board small while fully ground planing for an extremely low noise floor. The superb build quality of this assembly allow you to fully enjoy your music collection in a way you have never heard it before. Amazing detail, ultra smooth response and the classic sound of vacuum tubes. Cymbals ring, just like the real thing, not "ssssssssss" like you'd get from a solid state pre. Bottom end is punchy, defined and very accurate. Bass drums kick with authority, stand up bass growls. Mids, well, they're smooth as butter. And through it all, there's a welcome "airiness" that lets you know that listening fatigue is going to be a thing of the past under your roof! Who could ask for more. This circuit is closely based on the Marantz 7C line stage circuit. Of course the physical size of components available to Marantz in the '50's and '60's wouldn't have allowed them to build such a compact assembly. The circuit board measures only 2" X 6" and can be mounted on the horizontal or vertical plane. 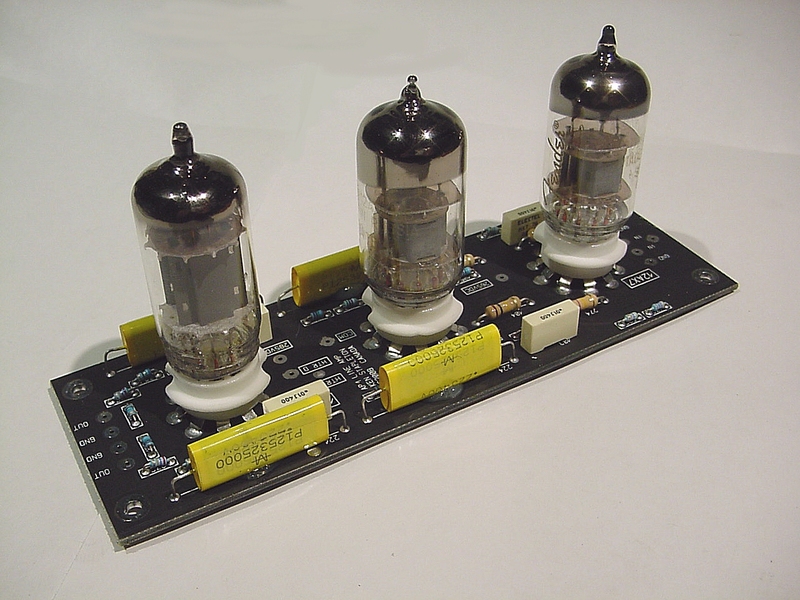 Tubes required are 2X 12AX7 and 1X 12AU7 (or use 3X 12AX7 just like the original circuit). You can run the heaters on DC or AC. You'll get less hum with DC of course. Gain is 18.5dB with a 12AU7 as the output buffer and THD is .02% at 1KHz. Better than anything you'll get from Asia! And soon I'll be offering online support and a complete preamp construction project. Keep an eye on it. I'm going piss off a lot of kit suppliers who've been pulling the wool over your eyes with myths and lies over the years. Great sound needn't cost an arm and a leg! NOTE - Vacuum tubes are not included with this circuit assembly and are shown only as examples in these photos. The circuit board is constructed of double sided 1oz foil hot air leveled FR4 glass. All connections are plated both sides for exceptional component retention regardless of heat or vibration considerations. All components have been specially selected for stability, tight tolerance and low noise. This is a premium quality circuit ready to give you the ultimate experience in listening enjoyment for many years to come! Consider picking one of these up. Availability is very limited. The build quality is outstanding and the hookup is simple, especially if you have any experience with vacuum tube circuitry. This is a fully assembled unit and all you need add is power, tubes, and input and output connections. Makes a perfect DIY tube line amp stage. Start listening to your music and enjoy it once again! CLASS IX and the CLASS IX logo are copyright 2009-2010 by Ken Stapleton. All rights reserved.